New Delhi: The Delhi Metro Rail Corporation (DMRC) today launched the top up (recharge) facility of Metro Smart Cards through ICICI Bank’s Business Correspondent Networks (Outlets) which are located across Delhi-NCR. With this new facility, the commuters will now be able to top up their smart cards at any of these outlets by paying in cash. These outlets can be easily located by the DMRC commuters by sending an sms to METRO<space>PIN Code to 9222208888. After reaching any of these outlets, the customer needs to provide the Metro Smart Card Number (i.e, Card Engraved ID which is written on back side of the smart card), the recharge amount (Minimum is Rs. 100/- and Maximum is Rs. 3000/- at present) and the mobile number to the agent at the outlet. The customer now can pay this amount to the agent through cash. The agent will then initiate the request. In few seconds, the customer will receive a final status of the transaction through sms on his/her mobile number. In case of successful transaction, the customer needs to validate the top up amount in the smart card by tapping it any of the add value machines (AVM-white colour machine) installed near customer care centre of 86 Metro stations (List of stations attached) in order to complete the top up process. This facility will allow Delhi Metro’s Smart Card users to recharge their Smart card at approximately 800 such outlets located across Delhi-NCR without queuing up at DMRC Ticket Counters. This top up facility started today in the presence of DMRC’s Managing Director, Dr. Mangu Singh. Presently, about 70% of the Metro commuters use smart cards. 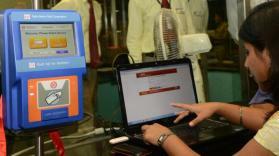 Approximately, 16000 smart cards are sold every day from the various stations of the Metro network.